The Saudi Arabian Insurance Sector is facing tough competition from the 35 licensed insurance companies in retaining their Saudi national employees. Newly licensed insurance companies are required to adhere to a Saudization ratio of 30% during the first year of operations, increasing up to 70% in five to eight years. Employee retention should be at the forefront of every insurance company radar. Hiring the right employee in creating a strong workforce is the start of a long journey, next you have to retain them. Simply put “Find ‘em and Keep em”. Career development is to provide progression advancement opportunities for employees. The career development will be designed to benefit, reward and motivate entry-level up to mid-level employees to continually learn and grow with the company while maximizing their earning potential. Quantify the impact of implementing a career development. Return on Investment (ROI) for career development programs is to quantify their impact on employee turnover & retention rates. 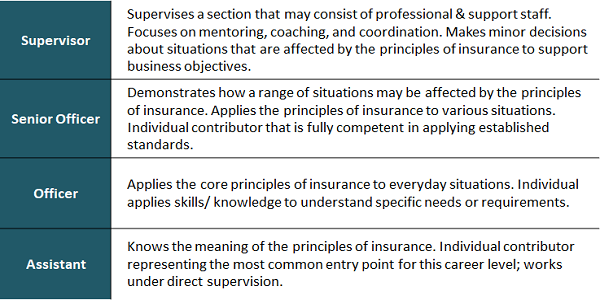 The career path is based on five (5) factors as indicated in the below table 1. These factors are used to determine employee eligibility of career progression within the career levels. ​Career path points have been defined and allocated against each factor to allow accumulation of points for career progression advancement. The career path factor points as indicated in the below table 2 will enhance the learning & career promotion environment for employees. 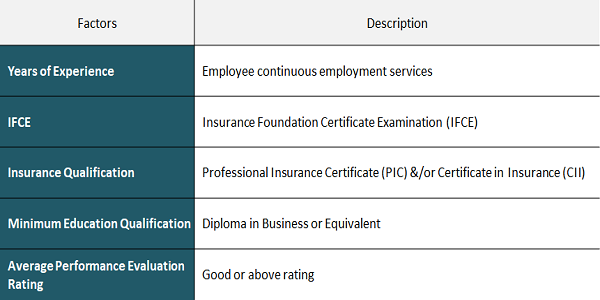 The career promotion requirements in the below table 3 will be used to determine eligibility of career progression. How to calculate the points for Sarah using the career path point accumulation system in the below table 4. Sarah joined an insurance company as an Assistant Underwriter. Sarah has accumulated 55 points and will be promoted to an Underwriter Officer. Human Resources shall provide guidance and assistance to employees to develop their potentials to the highest level. Department heads must work constructively with the HR Department, and encourage staff to develop their careers. HR & employee will jointly assess each factor against the her/his current career level and any gaps will be identified as development needs. An employee will be assessed, developed and monitored through-out their career progression stages. Self Development - This involves self-learning such as reading, continuing your education, etc. Performance Evaluation - This involves the understanding of the objectives and/or competencies required to properly perform a job. ​Contact us to learn more about our career paths.